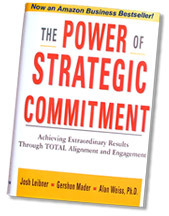 Video: How the Strategic Commitment Group helps organizations achieve their goals. We help leaders deliver large-scale change through total clarity, alignment, trust and accountability. Since 1989 we have helped hundreds of leadership teams define and implement bold, ambitious initiatives that generated significant returns for their companies. Our partnership enables leaders to focus on strategic objectives free from the politicking, distrust, turfism and timidity that separate ordinary leadership teams from those that consistently deliver on their promises.